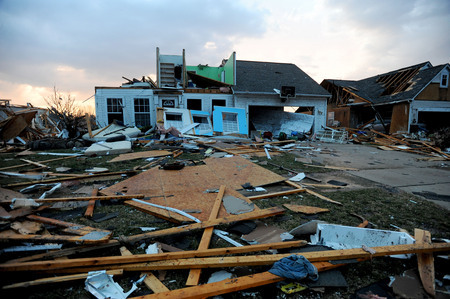 Posted on Fri, Mar 16, 2012 : 2:48 a.m.
House by house Thursday night in Huron Farms, residents of the Dexter subdivision assessed the damage from the tornado that tore through the neighborhood, destroying at least three homes and causing severe damage to dozens more. A home on Noble Drive in Huron Farms, just one with severe damage on a block hit hard by the tornado that tore through Dexter on Thursday. They expressed amazement at the devastation, its most severe at the corner of York and Noble yet extending in some way to what seemed to be every single home. They gave thanks at reports that no serious injuries were reported. And they pulled together, trying to figure out what was needed: Shelter, care for a pet, a bottle of water. Debbbie Haas, who lives on Quackenbush Drive, was in town when the storm hit, then she rushed home afterward. She could not believe the extent of the damage to the dozens of homes, and teared up at the thought of the personal loss felt by her neighbors. Sheriff's officials estimated that 68 homes were damaged in Huron Farms, located off of Dexter-Ann Arbor Road, just west of the commercial district at Dan Hoey Road. Rescue crews were there right after the storm as they checked damaged properties and asked whether residents needed medical care. They returned in force hours later, as the rain finally stopped but nightfall overtook the neighborhood, with firefighters doing more door-to-door checks and police restricting access to the community. The storm's effect on the homes was dramatic and obvious: Several were reduced to rubble, while more has extensive damage like roofs and walls blown off, exposing interior rooms. Garage doors were turned to twisted sheets of metal around vehicles, a chair ended up piercing a roof, windows blew out, a car twisted in the street and random debris littered most of the Noble until small bulldozers pushed it away just before dark. And the residents and their friends walked among the debris, stopping to greet each other, assure each other that they were fine and ask the question: What do you need? "That's just the neighborhood," said Amanda Pollard, 17, as a friend left her open garage. Just a few hours earlier, she was home alone as the warnings were issued that a tornado could touch down. Her mother, Sandy Pollard, was heading home from Domino's Farms in Ann Arbor as the storm struck. By the time Sandy reached the Busch's and Country Market on Dexter Ann Arbor Road, there was torrential rain, and she could see debris flying through the air. "That's when it hit me, 'I'm in a tornado,''' she said. She said she tried to stop her car, but her car was still moving side-to-side, and she was screaming in panic. Her main worry: Amanda. As she reached her house, she said the situation was unbelievable. They went into the basement and stayed there for half an hour. They had no TV and couldn't get a weather report. She said they heard a window blow out upstairs. The stayed downstairs until they heard firefighters pounding on their door to check on them. Sandra said they went upstairs and when they looked outside, the house across the street was destroyed. She worried about the elderly resident, until she learned that he's believed to be OK.
Henry Haley, a contractor for Haley Mechanical, was trying to assist residents by turning off gas lines to their homes. He'd just come from the village, where the laundromat and car wash had been flattened in the storm. Henry Haley stands outside of Aaron Mitchell's house on Noble, where he'd turned off gas lines. There, he'd smelled natural gas and acted quickly to turn off those gas lines. Heading over to his friend's house on Noble, he quickly realized he'd need to do it at many homes there, too. His worry: People would try to start their cars in their garages in an attempt to leave the area, prompting an explosion. But getting close to the gas lines put him right in the heart of the storm damage. He knows many of the people affected, he said. Many neighbors were milling in the street Thursday evening, walking through debris, talking to each other and surveying the damage. Gary Farber, who lives in a condo a few blocks from the heart of the damage, said he had never experienced a tornado before. "These people's lives are turned completely turned upside down,'' he said of his neighbors. 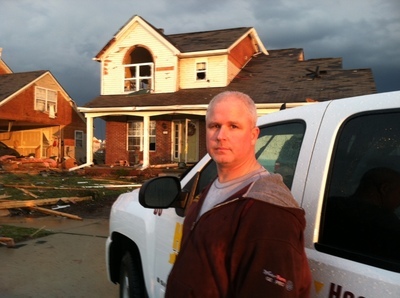 Aaron Mitchell said he was in Ypsilanti with his children when he heard the tornado warning. He said he headed toward home, and by the time he reached Zeeb Road, he received a text message from a friend telling him about the damage in the neighborhood. He arrived home about 7:25 p.m. and was standing outside his SUV, with his toddlers still in their car seats, while he tried to assess the damage. "I'm trying to get my brother to come get my kids so I can go inside,'' he said. An hour later, he was still watching his children. But his wife had returned home, and she ventured inside, giving him a report. "It's pretty bad," he simply said. Most residents seemed to have heeded storm warnings, with some rushing to their basement as they could see the funnel cloud approaching from the northwest. Jeffnier Copland was home on Noble with three children when she heard sirens. They rushed to the basement, but not before she saw a funnel cloud from her window. "We heard an explosion," she said. "The wind was blowing out the windows." By the time they emerged from the basement, most of the house's floors were covered with glass, and her back deck was in a neighbor's yard. She joined her many neighbors in walking around, taking some photos but first asking if people were OK.
And, like her other neighbors, asking what she could do to help. "We're just walking around," she said, "trying to see if someone needs something." Paula Gardner is News Director of AnnArbor.com. She can be reached by email or followed on Twitter. Fri, Mar 16, 2012 : 3:04 p.m. This is a sub division that has relatively newer built homes. The extent of damage is not surprising as to how they are built and built quickly. Most older homes built by better stuff did survive the damage. Ours is over 50 years and has survived everything so far. Good to the rebuilding. Fri, Mar 16, 2012 : 2:55 p.m.
http://www.wc-redcross.org/ This is where they need your donations, they don't need anything but monetary donations. Fri, Mar 16, 2012 : 3:31 p.m. This website should be posted with all the Dexter Tornado coverage for the next week or so. I have been out there and have family there too, but not in that area. I have donated $100, to the posted website you posted here. To post the site will show the public that donations are needed. Fri, Mar 16, 2012 : 2:53 p.m. I would like to express deep gratitude to the first responders who were in our neighborhood within moments of the tornado. They must have been out in the storm tracking it to see where help would be needed. They stayed through the night checking on residents and securing the neighborhood. Brave admirable people all. Sheriff, police, fire, etc. Thank you very much! Also, thanks to those who ensure the emergency system functions. The sirens undoubtedly saved lives yesterday. Fri, Mar 16, 2012 : 2:51 p.m. I can remember several nasty storms, but tornado's are very rare around these parts. But, as far as tornado's go, one that I remember and that was in Westland and didn't fully touch down, and just took the awning off and placed it on top of the house. I was there visiting some family member when I was six and that was forty years ago. I have lived in this are sense I was born and no tornado, except for that one. This storm that passed threw was a product of climate change. Fri, Mar 16, 2012 : 1:26 p.m. Thank you to whoever TOOK and POSTED the You tube video on A2 News. I'm so sorry to all those hit by the storm who had property damage. Glad everyone is okay. Fri, Mar 16, 2012 : 11:55 a.m. So what can we do to help? Anyone know who is spearheading the recovery? Do they need donations? Volunteers? Fri, Mar 16, 2012 : 2:54 p.m.
Fri, Mar 16, 2012 : 1:45 p.m. I would assume they have home owners insurance. I get a $1000 clothing allowance per person and they will pay for a long term hotel. Fri, Mar 16, 2012 : 12:11 p.m.
Fri, Mar 16, 2012 : 11:06 a.m. I just added a photo of Henry Haley that I took at about 6:30 p.m. last night on Noble Street. We were standing amid the worst of the storm, and had just moved out of the way for a backhoe. Fri, Mar 16, 2012 : 11:03 a.m. The scene is more than a little surreal here in Dexter this morning. Huge police light units are shining into the fog for security as the ground remains strewn with the debris of so many damaged and destroyed homes. We were just spared a direct hit, but a house not far away on Wilson near Ryan is leveled right to the ground. The damage to that house is worse than what's over at Noble &amp; York. Most of us in the tornado's path have extensive repairs ahead of us - mostly roofs, siding, and outdoor structures like fences and sheds. Lots of homes along Wilson in the Orchard River Hills subdivision (there are actually two subdivisions in this neighborhood) have seen windows blown out and sections of their roofs torn off. Thank God everyone heeded the warnings and got out of harm's way! Fri, Mar 16, 2012 : 10:49 a.m. I headed to Dexter about 5:10, going to Mill Creek Sports to do some practice shooting at their range. Got downtown about 5:28 and - almost simultaneously- the radio broadcast the tornado warning &amp; the sirens started blaring. I took one look up at the roiling clouds and turned back to Ann Arbor. I'd come through a hail storm to get there, then had to go through it again before getting to Wagner Road. I had to park the Zipcar in the Thompson Street lot and walk about 700 yards through THE SAME hail storm! That's three passes through the same hail storm - enough for me! That storm was the real deal - glad no one was injured by the tornado. And: who can remember a T-storm that big and intense in mid-March? Fri, Mar 16, 2012 : 2:47 p.m. I can, several, but very rare around these parts. But, as far as tornado's, one that I remember and that was in Westland and didn't fully touch down, and just took the awning off the house and placed it on top of the house. I was there visiting some family member when I was six and that was forty years ago. I have lived in this are sense I was born and no tornado, except for that one. This storm that passed threw was a product of climate change. Fri, Mar 16, 2012 : 10:18 a.m.
&quot;Henry Haley, a contractor for Haley Mechanical, was trying to assist residents by turning off gas lines to their homes. He'd just come from the village, where the laundromat and car wash had been flattened in the storm. There, he'd smelled natural gas and acted quickly to turn off those gas lines. Heading over to his friend's house on Noble, he quickly realized he'd need to do it at many homes there, too. His worry: People would try to start their cars in their garages in an attempt to leave the area, prompting an explosion.&quot; That folks, is a hero. Well done, sir! Fri, Mar 16, 2012 : 3:23 p.m. I would say that he did what he is capable of doing in a crisis. Thanks for that sir. There are not many who would go out of their way and put their life in harms way to help others.